While at least the freeway is open now, it still looks pretty ominous seeing this giant block of fire in the middle of the map between work and home. I suppose I’m lucky neither place has burned to the ground and I’m just complaining about first world problem. But I’m still concerned commuting is going to be hell for a while. My normal commute through the canyons is completely gone for weeks if not months. 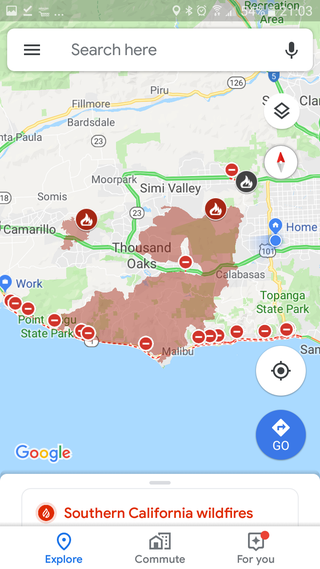 I should be able to at least take the PCH out to the not burnt roads eventually, but that will still be a bit seeing as the fire is still ongoing. This bridge is smack in the middle of my commute and marks a choke point of sorts for the various canyons that I normally have used. Even once the fires are out and there is some sense of normalcy, that bridge is still going to be a pile of rubble. That might take a while to fix..